On December 14, the 12x12 Congress "The Great New Year's Encounter" will be held. The 12 × 12 Congress is an annual event aimed at bringing together the entire ICT sector and summarizing the entire ICT year in Catalonia. In this event, the Women ICT 2017 Awards are awarded. These awards aim to give relevance to those women who, throughout the year, have distinguished themselves in their professional activity within the Technologies and Communications sector. 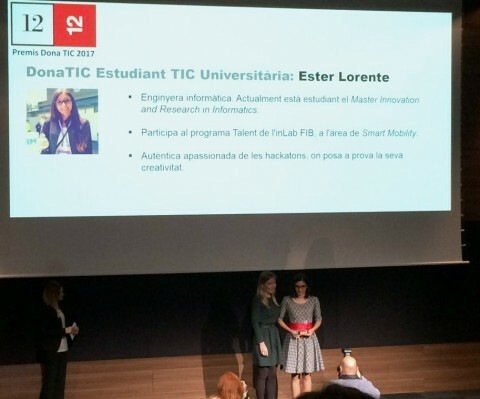 This year, one of the winners of this award is the inLab Ester Lorente in the University ICT Student category. He is currently studying the "Master Innovation and Research in Informatics" at the School of Computing of Barcelona of the UPC. At the same time, he participates in the programa Talent of the inLab FIB, in the area of ​​Smart Mobility where he collaborates in real projects with companies such as SEAT and Volkswagen, simulating the mobility of the future. His Final Degree Project, which combines computer and transport knowledge, was part of the CitScale tool, a data analysis and visualization tool to analyze mobility solutions (electric vehicle, shared vehicle, etc.) that has been presented in different professional and scientific events. She is also passionate about hackathons. This year he has participated in six and in five of them has received some prize or mention.